See this seaside city of fun buzzing with excitement and laughter! 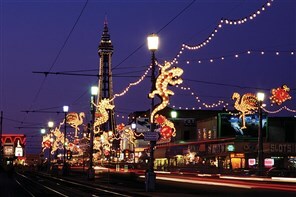 At 10 kilometres long and using over one million bulbs the Blackpool Illuminations are an awesome spectacle. Free time during the day to take in the many sights of Blackpool. Staying at the 4* Imperial Hotel Blackpool with bed and breakfast and 3 course dinner. The Imperial Hotel, Blackpool, is a grand 19th Century hotel recalling the opulence and glamour of this famous resorts Victorian heyday, with all the comforts of modern life situated on North Promenade. See this seaside city of fun still buzzing with excitement and laughter long after other resorts have gone into winter hibernation! At 10 kilometres long and using over one million bulbs the Blackpool Illuminations are an awesome spectacle. Board the coach to see the illuminations. Free time during the day to take in the many sights of Blackpool. The Blackpool Illuminations (30th August - 3rd November 2019) consist of almost every kind of light display you can imagine: lasers, neon, light bulbs, fibre optics, searchlights and floodlighting. In 2012 there were more than 500 scenic designs and features. There are set pieces made out of wood studded with light bulbs: the characters and objects portrayed seem to move by way of winking lights. Three-dimensional illuminated scenes are also popular. There are over 500 road features attached to lamp posts linked together with festoon lighting. Strings of lights along the structure of buildings pick out landmarks in luminous detail  you can always make out the Tower and the Pleasure Beach rides in this way. The design of the Illuminations, until very recently, has all been carried out in-house by the Illuminations Team. But for the first time in 2007 an outside designer was added to the team. I say added as its not just being able to design that counts it being able to design and work with the whole illuminations team that really counts. The team are a small highly skilled and experience bunch of very enthusiastic people dedicated to the yearly Illuminations spectacular. After the success of Laurence Llewelyn-Bowens Deco Dance in 2007 Laurence was again asked to design a new feature. The feature is under construction and thanks to the dedication of the team should be ready for switch on night. Step into the sensationally stylish Blackpool Tower Ballroom and prepare to be lost in a world of elegant charm and refined beauty. Dating back to 1894, The Blackpool Tower Ballroom is world famous for its unique sprung dance floor and spectacular architecture and remains to this day a destination for dance fans from across the globe. You can dance the day away to the sounds of the famous Wurlitzer organ amidst this stunning setting, or watch from the sidelines. Whether you want to glide around the dance floor, relax at your table or spectate from up on the balconies, The Blackpool Tower Ballroom is an experience you will never forget. Begin your journey to the top of the Tower with a visit to the incredible 4D cinema. Let the special sensory effects and incredible filming bring the history of The Blackpool Tower to life in front of your eyes. Then take a trip 380ft into the sky to the top of The Blackpool Tower and experience the thrilling SkyWalk. Walk out if you dare onto the five centimetre thick glass viewing platform, where you can look out into the Irish Sea and see the famous Blackpool Promenade below you. See the North West of England spread out before you with views over Bowland, up to the Lake District and on a clear day down to Liverpool and across to the Isle of Man. The Imperial Hotel, Blackpool, is a grand 19th Century hotel recalling the opulence and glamour of this famous resorts Victorian heyday, with all the comforts of modern life. Situated on North Promenade, The Imperial Hotel is a Blackpool landmark and has welcomed a host of royalty, politicians, statesmen and stars of both the stage and screen over the years. The hotel enjoys spectacular views of the beach to the sea and is close to all major attractions.